At some point, the authority of the parent stops being the ultimate authority. When it comes to the powerful mind altering substances of drugs and alcohol, “because I said so” won’t cut it. Instead, help your family understand the reality of addiction, alcoholism, and the risk of experimenting with substances. Thankfully, the internet is full of educational videos- even cartoons- that explain how addiction and alcoholism work in the brain. You can find helpful statistics, and even some videos on YouTube documenting overdose. It isn’t about scaring your family into sobriety, but educating them to make better choices. First and foremost, it has to start with you. Children are monkey-see, monkey-do even if you tell them not to be. If you’re routinely drinking at home or using prescription medications out of course, you’re setting the standard for how everyone else should be relating to drugs and alcohol. For everyone else there should be clearly defined rules about drinking and drug use, accompanied by consequences. Additionally, you should outline the boundaries of what’s allowed in the house and expectations if you allow any experimentation at home. 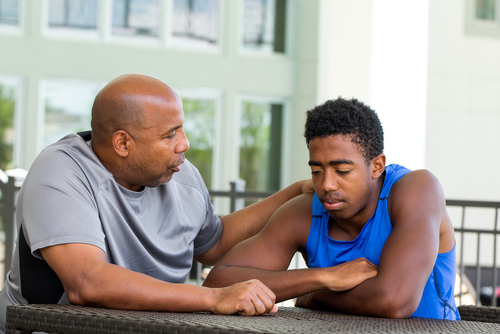 If your family is heading toward recovery, this conversation is exceptionally important. You probably know in your heart of hearts that something is wrong. Someone in the house is using drugs and alcohol, but you haven’t caught them yet. You don’t want this conversation to be a matter of condemnation. What this conversations serves as is opening the portal for communication. Drugs and alcohol are out there and many people experiment with them. That doesn’t mean it will happen to anyone in your home. Remind your family that the choice is theirs and that addiction doesn’t happen to everyone, but it certainly can. Stay positive about the strong bonds you have built, the way your family comes together, and the love you share. Hired Power is here to help you navigate the unchartered waters of addiction once it enters the home and help you make the home ready for recovery. For information on our recovery services including sober monitoring and safe passage transportation, call us today at 1-800-910-9299.